2012 Black on Black LS460, clean Carfax, West coast owned, Every Option, PURE CLASS, IMMACULATE. This is a one owner west coast vehicle with no blemishes or accidents on the carfax. To find one of these LS460 Lexus models that is a one owner is tough to do. The previous owner spent over $80k on this LS460 and when somebody spends that much on a car they tend to take care of it in such a way. It shows with the condition of this Lexus inside and out That the previous owner loved this thing like their "first born." haha....but seriously this Lexus is one cherry piece. The fact that is a little newer being a 2012 is everything. The year plays the biggest role in the value in any car for a reason. Warrantys not only have mile limits, but time limits as well. Time breaks down everything, father time has never lost. THis 2012 Lexus will drive much better, tighter, and quieter than and Ls460 under 2010. You could have 40k on a 2007 Lexus Ls460 and its leaking, a window doesnt work, it makes a bunch of noise....Because its OLD. Everyone knows who research Lexus and these cars in particular that this 4.6 liter all engine V8 is one of the best most reliable V8's EVER made. They put it in a few other models as well like their signature SUV, the GX460. These engines have been time tested and are known to go 250,000 miles and more. The black on black color combination is rich and all the chrome accents on the car tie in with the upgraded sport package Lexus wheels. The paint is still relatively new and it seems to have been garaged by the previous owner because it has that new car black paint look in the sun when its clean. The interior is in "like new" shape and has almost every option you could ever want when buying a luxury sedan. Comes loaded with "high value" options such as Mark Levinson sound, heated steering wheel, cooled seats, rear heated seats, back up camera, navigation, Bluetooth, wood steering wheel and more. The Upgraded Lexus sport wheels are wrapped with almost brand new Michelin Pilot Sport tires. That tells us the previous owner was a car guy and that's huge value for the next owner. Roughly $1000 value than if it had tires that needed to be replaced soon or some no name brand that drive like crap. When you are driving a car as nice as this, you need the high grade tires to really feel this car float. It drives like its on a cloud, so smooth and soft. This is A Lot of car at a great "price point". This car would have been $4000 more 6 months ago. The LS460 models just dropped into the honey zone and are now a great buy with the zone that they are now in. Lexus holds its value very well and this Lexus will be worth $4 to $6k more than most any other $22k car up for sale. Value retention is real money and the LS460 likes to help you keep that money for a trip to Europe or a college fund for your kids. We also offer extended warranties on all of our vehicles for the best deals in the state because of the two owners that do everything and the low overhead we have created. This is a west coast owned so there is no rust/corrosion issues! Dealers can buy cars from Illinois, New York, East Coast, Midwest Michigan ect with rust for $2500-$5000 less than the same car but from the west coast. Not only is this a west coast car its a 1 owner with no blemishes at all on the Carfax. No accidents or damage reported, minor damages, rental car, or odometer roll backs. 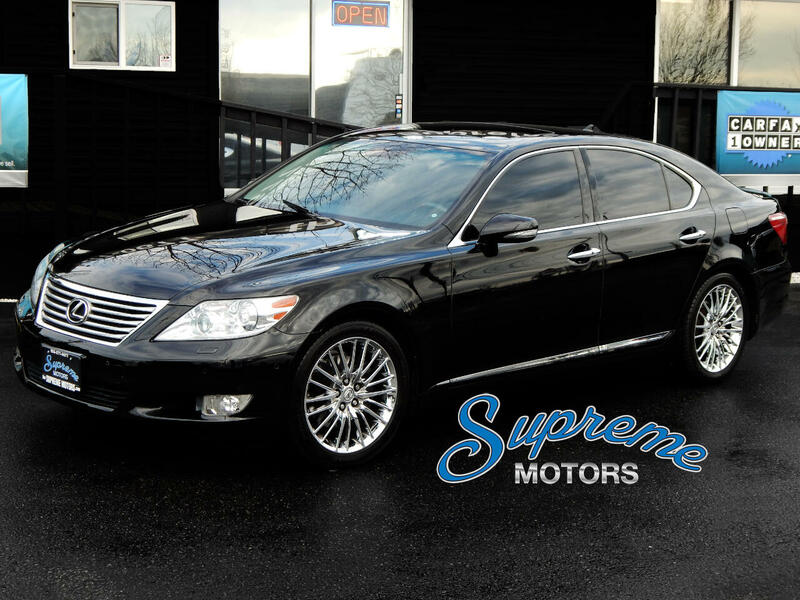 At Supreme Motors, we ONLY sell the best of the best and this LS460 is another prime example of our meticulously inspected, coveted color combination, clean Carfax, and rare optioned inventory that we select for our new clients. Call or email with any questions or stop by any time to check it out.